Today’s interview does not showcase a writer. It will explore the inter-workings of ALL CAPS PUBLISHING, the self-publishing collective started by our very own toad Marian Kent. While the established publishing industry is busy bending to the whim and needs of the masses, many writers are making the choice to print and “pedal” their own wares. ALL CAPS is a venture which seeks to unite writers for a common good. 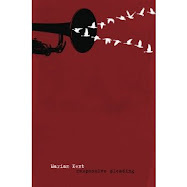 I welcome you all to a conversation with Marian Kent as she explains the vision of ALL CAPS and speaks to her endeavors in creating and publishing her first book of poems Responsive Pleading. When did you start ALL CAPS? I created ALL CAPS PUBLISHING when I published my first collection of poems, Responsive Pleading, in April of last year. I knew that I wanted to create an imprint for myself, to help make my book look extremely professional. It only took a small leap in thinking to decide that I’d create a cool, professional brand, with a website and a clear identity, in the hopes that other terrific writers might join me in a collective, sharing energy and supporting one another in self-publishing our books. Why the name ALL CAPS? My “about” page on my blog (runaway sentence.) has long contained as part of my self-description, “I am prone to hyperbole and SHRIEKING IN ALL CAPS.” And that’s because it’s true, I actually AM prone to all-caps rants and exclamations. But more importantly, the ALL CAPS tagline “poetry and fiction emphasized” really resonated for me. And ALL CAPS is just cool. Or at least I think so. What are you trying to achieve by running your own publishing company...what is the "vision" of ALL CAPS? Well, I’m not a publisher and we aren’t a publishing company, though I’m pleased that we are so professional that people assume we are. I wanted to bring people together who are self-publishing on the premise that there is strength in numbers. I wanted to align myself with other excellent writers; to stand up my writing next to other strong, well-written tomes. I also love the idea of community, and hope to build one with ALL CAPS, not to replace or compete with anything that already exists (like the Imaginary Garden, for example) but to provide a different, new and supportive space for writing and publishing. The ALL CAPS website has forums that we haven’t utilized a whole lot yet, but that I hope will become more active. The ALL CAPS Facebook page/community has generated some interesting conversations. I want more of that. Criteria for Normalcy by Yve Chairez is the latest release from ALL CAPS. With such a collaborative spirit and community minded mission statement, are you looking for a certain similar tone to the books you produce to create a cohesion in writing as well as in author’s intent? What a great question. I’d say no, there’s no attempt to find similarity in tone or style. In fact, as far as I’m concerned, it’s the opposite. The more diverse our group of writers, the more variety in style, tone, subject matter, the better. What is crucial is that no matter the tone or style of our writing, the authors present our work professionally and flawlessly. The focus is on quality writing, not a particular style. You’ll see that the authors whose books have already been published or are in the queue are very different from one another, which makes for really interesting reading. Do you feel that the self-publishing industry lacks professionalism as it is now? You know, I wouldn’t go that far and I’m not particularly an expert about publishing or self-publishing. I was motivated from the beginning to self-publish because I’m controlling (or maybe protective is a better word) of my own writing. It’s also because I’m so busy as a working mom that I simply can’t spend my limited time querying and endlessly sending out poems to journals, that kind of thing. I guess I am saying that I want to be the boss of my own writing, and I always want my writing to stand up next to good writing. So I decided to create that kind of community here, and so far, a fair number of people see it the same way and have joined me. It’s exciting! I really like your angle here, mostly because there is a slight stigma (or there has been a slight stigma) on the self-publishing industry. Some are of the thinking that if a book is self-published, it is second rate writing. But...the times they are a changing. With the death grip bookstores have on the publishing industry, this can be an opportunity to take back the rights of authors. Do you view ALL CAPS as a grassroots sort of thing? Yeah, I guess I do. Certainly I understand what you are saying about stigma, and that’s why I’m so controlling about the presentation of my writing. I think no reader would guess that my book is self-published, as it’s attractive and professional, has a cool publisher’s imprint, a gorgeous cover, and so on. It’s just very well done, and that is extremely important to me. Like, when I put my words out into the world, everything has to be perfect. I’m fairly obsessive about my blog’s appearance, too. About the larger issue, though, yes. I am not against publishers or bookstores or anything like that--in fact I spend a lot of time and money in bookstores and buying books--but I figure, it’s possible to do this, there’s a lot of good energy around it, so let’s see what we can make of it. The Trees are on Fire is one of two books ALL CAPS published last year. Are you the sole captain, or are there others who help shape the collective? I mean it when I say my vision is of a collective, but it’s also true that, so far anyway, I’m chief cook and bottle-washer. Right now, as we are small and just starting, my ideas and energy are driving it, but that is changing a bit. My dream is that everyone will participate and have a say, both in terms of day-to-day decisions, finding new wonderful writers to join us, and the big picture/vision stuff, too. Last week, the website for ALL CAPS listed two titles, but now you have three, and "the" Facebook promises BIG things to come this year, can you speak to some of these exciting things in ALL CAPS' future? Yes! 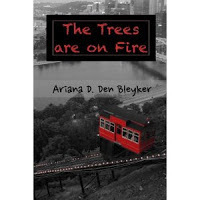 Last year, two books were published via ALL CAPS: a gorgeous full-length book of poems by Ariana Den Bleyker (editor of Emerge Literary Journal) called The Trees Are On Fire, which you should all get your hands on because you’ll love it, and my first collection of poems, Responsive Pleading. I’m pleased to announce that just this week, our third title was published! Criteria For Normalcy by Las Vegas-based author Yve Chairez is a “bold collection of short stories and poems that flirt with the boundaries of the absurd, whimsical, and sociopolitical.” In other words, fantastic. And soon to come is Gemini/Scorpio/Capricorn, a book of poems by fellow Toads Fireblossom, Mama Zen, and Hedgewitch. Yippee! Other projects in the pocket for this year include poetry books from our own Head Toad Kerry O’Connor, Steve Schultz, Joy S Grape, and Sarah Whitely; poetry and fiction from fellow Toad Corey Rowley, and fiction from Michael Webb, plus some other projects-in-the-works. And I almost forgot to mention that I have a second poetry collection coming out this spring, too. ALL CAPS and Real Toads have some exciting plans for Poetry Month, as well, which is coming up in April. We plan a chapbook contest for poets who follow along with daily prompts in the Imaginary Garden. Poets who are members and followers of the Garden who write thirty poems in April will be eligible to submit their 30-in-April chapbook manuscript to ALL CAPS.... details to be announced soon! Do you find it difficult to be starting a publishing collective in a time when books (poetry and fiction) seem to be on their way out? How are you adapting to this? Actually, I think it’s a great time to be doing something out of the mainstream in publishing. I don’t really feel the trend of people being less interested in books, as I just keep on reading and buying books (paper books and e-books), and people around me do, too. The world of publishing is so much in flux that it seems like self-publishing, especially in a highly professional, collective fashion, is a viable, respectable alternative. I’m really pleased at how my writing is received and the level of interest in ALL CAPS. It’s thrilling. And right now, the energy is there, it’s all positive, and it feels like it’s going to be an interesting and productive year for all of us. The drive to produce a book of poetry on her own terms was the catalyst to starting ALL CAPS. Above is an image of Marian's book of poetry, Responsive Pleading. Responsive Pleading is the title of a poem in the collection. It’s about flying off with a flock of geese, spending time contemplating, and then going home again. It seemed to represent the general story-arc of the collection. Plus, as a no-longer-practicing lawyer, I like to play around with legalistic words and phrases, and “responsive pleading” is one. I organized the book in four sections, for each of the four seasons, as the poems seem to tell a linear story (in reality they don’t, but I was able to present them that way) chronologically and in connection with the passing of a year. It wasn’t, really. Maybe you realize that I have (as do many of us here at RT) an almost-daily writing practice. As the result, I had many, many poems to choose from. The ones that were better and seemed to fit rose to the surface naturally. Some of the selection process is organic and hard to explain, but once I piled up the poems by sections, it was easier to organize them. For the (new) collection I’m working on right now, I have seven sections/chapters. So each is a smaller group to arrange. Sometimes a few poems go together by theme or subject matter, sometimes by form or appearance, and the rest somehow just fit in. You know, I feel like I’m just making all this up as I go, and I don’t have a lot to compare my success to, but I have been blown away by the response to my book. I’ve sold over a hundred paper copies and a handful of e-books, though to be truthful, my measure of success has more to do with the way people talk about it and share it than with sales. I have done a few readings locally, but I could do much more on that front. I have spent no energy on getting my book into local bookstores, which I should do (and swear I will with the next book). I’ve been interviewed a couple times (like this great one with author Eden Baylee) and my YouTube channel has been fun. I’d love to see one of my videos go viral, then I’d be ACTUALLY famous (instead of just in my own mind). My book is in the library in the town where I grew up, in which I spent a ton of time as a child and teenager; I received a note from the librarian thanking me for having it there. That is just amazing. That’s enough. People are on hard times, and it’s difficult to get people to buy a book. Even a beautiful and wonderful book that will probably affect you deeply and that’s as cheap as your lunch. That can be disheartening. Don’t get me wrong, I have no illusions about making a fortune (or even any money) through poetry, but the part of me that’s super-proud of my gorgeous book thinks EVERYONE should have a copy. Something that required thinking about when I published my book was the merging of my real identity with my blog identity. I know some Toads will relate to this. I’ve always been myself, always Marian (not a pseudonym), but I never allowed my last name (or my family members’ names) on my blog, for privacy and security reasons. Of course, my book is published in my full name, first and last. I would not have made another choice, but I had to really think it through. I know a publishing magnate! yayyyy! I'm so proud of you, Marian. What you have described to us constitutes a huge leap of faith, and I know how much positive energy it requires to keep up the motivation when it comes to putting together a book (mine is on terminal hold). I'm so admiring of the fact that you have energy to spare for others. I found the interview to be both inspiring and enlightening, and my thanks to both you and Izy for bringing it to us today. Thanks for sharing your thoughts and exciting venture Marian ~ A lot of hard work, collaboration and creativity goes into publication. Many thanks to Marian for being a willing participant in the interview process. Her enegery and enthusiasm to produce stand out work and to help others onto a similar platform is applaudible! what a wonderful interview, it's so exciting to read about new books of poetry being published so we can read and share such a beautiful form. I'd love to get involved at some point in the future. hedgewitch, for the longest time i thought the best business idea was a laundromat/beer bar called "Duds & Suds." with that not having come to fruition (and any of you who are so inclined, feel free to steal)... may as well work on making my fortune publishing books. HAHAHAHAH. everyone, watch for the formal announcement of the Real Toads Chapbook Contest, later in March! exciting! Wow. I'm impressed! My daughter (17) wants to be an editor when she's older. Maybe by then, you'll be famous and have money for a staff and hire her! Good for you on believing in yourself and taking on a new challenge. What a cool idea, to bring us info about Marian's publishing company. Yes, Shay - get that book together! Your plans for this year sound amazing. Wonderfully inspiring interview . I know it takes a lot of energy and hard work to produce the amount of work you do, Marian, not to mention running a publishing company at the same time. You are pretty amazing! hah, amazing or crazy. hey, Shay HAS a book coming out soon! Lolamouse, everyone needs editors. the more editing, the better, in my book. too many books, too little editing. heh. This interview answered ALMOST all of the questions I had about the collective. Are your collective partners also $$ investors? What steps would I take if I wanted to submit a manuscript for publication? Miriam, I am impressed with all you do! And Izy! The tone and pace of this interview is different that the others but as in all, it's most appropriate to the subject matter. You are one amazing interviewer and writer. Love is coming your way, lots of it! Toads, a Chapboodk challenge for 30 days is most wonderful! I just which it had been ion march or May, an M-month for Yummmmmmy. I'm writing on the Empire Line heading up to Coxsackie, NY--lots of bumpy tracks next to this beauteous river. Excuse the typos, please! you're welcome! i'm all pleased & stuff. thus far, authors (other than me) are not $$ investors in ALL CAPS, but everyone is fronting their own expenses. i can talk more with you, Susan, or anyone, about those details. 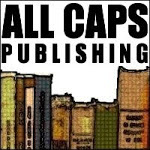 if you (or anyone) wants to submit a manuscript, or wants to learn more, the best thing would be to write an email to info@allcapspublishing.com and we can discuss privately. one important note: ALL CAPS is focused on poetry and short fiction, at least for now. we are not accepting submissions of novel manuscripts (because we don't have the staffing, ahem, volunteer bandwith, to read novel manuscripts). if you have a novel, write me for a referral/suggestion; i have a (very talented) friend who is doing something similar in the novel arena. Enjoyed this interview very much. Thank you. what a wonderful interview of a poet and writer that I have unlimited amounts of respect for. I know how hard you work Marian, how you worry and cheer over work that is good, and you help to make it published. it's inspiring and motivating. My hope is that ALL CAPS becomes everything you dream it to be, that you see it bloom and flourish with all kinds of voices and words. Plus if I have any questions about publishing now, I know where to come. LOVE this interview! And I love the professionalism of ALL CAPS. My last book, a poetry chapbook, was produced by a lovely independent publishing house located in Kentucky. Although I have been very happy working with them, I must say that ALL CAPS products are superior in appearance. That says a lot. I'm expecting "Criteria for Normalcy" to arrive today, and cannot wait for future offerings. Bravo to the cooperative! Marian, I have published poetry books using Lulu Publications, which truly is very straightforward and user friendly for those who want to produce a book. Would you explain what you do that is different than / beyond that. In other words, what would be a further benefit for an author to use ALL CAPS as a 'middleman'? well, it's the idea of doing it together with other people, of a group of people supporting and promoting one another. if you look at the ALL CAPS website, you'll see that we have a group of authors (and i'm getting some new bios up as we speak) and more titles coming. i am promoting our authors and titles via the website, via Facebook, Twitter, my own personal blog and accounts in those spaces; and the other authors are doing the same. it's strength and energy in numbers instead of going it alone, and standing up our writing next to other excellent writing. i'm very familiar with Lulu, and i published my book via CreateSpace, which is similar. i didn't want my book to say "Lulu" or "CreateSpace" as the publisher, but to have my own imprint. to have other good writers sharing in that imprint and working together for our mutual success is what makes it different than self-publishing alone. hope this helps! I love it Marian. This is an exciting venture and I hope to be part of it with my next book! Thanks for all your work and inspiration. Thanks Izy for a great interview! Thanks, Marian. I do understand the concept of doing something together and supporting one another. It seems that the primary thing you would do would be to help promote one another. I just looked at my Lulu-published books. They don't say "Lulu" at all. No publisher is mentioned..thus Lulu does not promote itself. I did look at your website. Do people submit their manuscripts to you and then you take them from there? Is it you who arranges the books to be printed, or do people do that on their own? It definitely seems to be an interesting concept. i'm not printing anything myself, i'm supporting/helping our authors to self-publish. if anyone is interested in submitting, drop us a line at info@allcapspublishing.com and we can discuss in more detail and take it from there. Oh my god, I just wrote a long sappy response to this remarkable interview and then my phone crapped out. Okay, as writer of the aforementioned Criteria for Normalcy (yay! ), I don't think I would've published my book if it weren't for Marian and ALL CAPS. It really helped give me that extra push I needed to actually take the leap and publish. Marian championed my work from the beginning and was there every step of the way for feedback, freak outs (I'm prone to many), and just overall support. You really need that in self-publishing, I think. Despite the name, "self"-publishing can't really be done alone. You need an editor, a designer, second opinions... And now that ALL CAPS has grown so much, there is lots of help and opinions to be found within the collective and it's just great. The whole thing is great. Great concept, great people. And Marian is just such an inspiring woman. I'm so happy to be a part of her vision and so in awe of the fact that she manages to get all this done! i guess the bottom line is, it's good and exciting and it's all our own. I wasn't going to say any more in regard to this discussion, but Yve, you said that a person can't 'self publish' alone. I truly beg to differ with that statement. I have done it. Others I know have done it. I appreciate your passion for ALL CAPS, but individuals do self publish (and it isn't that hard) every day. That is what Lulu and Blurb and others are about. And they do produce a quality book. apples and oranges, really... no one is disagreeing, and definitely not judging, here. the truth is, Yve published her book all on her own, including designing a fantastic cover, and i am just a very good and tireless cheerleader and promoter. Very thrilling to read!! I need to put a link on my side bar!! Yve, since you asked....I personally did not seek any outside advice during the publishing process. And I know others who did not either. What Shay said! Fabulous interview, Marian! It would of been nice to do a Garden book with all Toads included. Ella, I'm not sure if I know what you mean about the gym class. Certainly if the toads likes the idea of an anthology, we could approach Marian with this idea. I have read the commentary with interest and I think it serves to highlight exactly what ALL CAPS stands for: support, second opinions and encouragement in an industry which chews up and swallows many would-be authors and poets. Of course, Marian's vision will not be embraced by everyone out to publish, but it is wonderful to know that such an option is available. This is wonderful--your projects and the interview. I self-published my own book of poetry and photography a couple of years ago and have not regretted it at all. I sold more than 125 books--hardback and paperback and did readings locally. I have yet to fully explore the e-book option and am not sure how color photos would play there. I too liked having control of the way the book looked and was printed. It looked very professional and I would use the same process again if I ever got myself organized to put together another collection. The April project sounds good. I hope to participate! For the record, "ALL CAPS" is cool - like, bow tie cool. Marian and Izy - thanks so much. I so admire your energy and spirit and vision, Marian. That's just terrific. It takes a lot of time to do this and it looks like you are doing wonderful and exciting things. Good luck! k.